In addition to the Dice.fx and PipPlacement.fx files from the Roll the Dice post, this program consists of the following source code files. 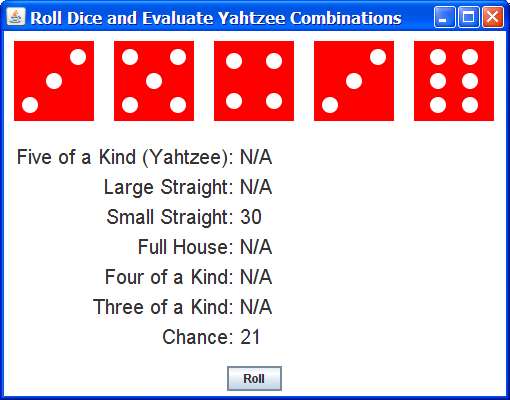 *  components with CompositeNode and evaluates Yahtzee dice rolls. title: "Roll Dice and Evaluate Yahtzee Combinations"
text: "Five of a Kind (Yahtzee):"
text: "Four of a Kind:"
text: "Three of a Kind:"
A JavaFX Script concept that we haven't covered yet is the set of static functions available in the new javafx.lang.Sequences class. These functions enable you to perform operations (such as sorting) on a sequence. In this program I'm using the max and min functions of that class to find the largest and smallest value in a dice roll.